Who wants to spend all day cleaning their house? Not us! Getting down to the nitty gritty and cleaning up quickly without wasting the whole day can help save time and get us back to what we really want to be doing. Or, you might be limited on time and expecting guests. 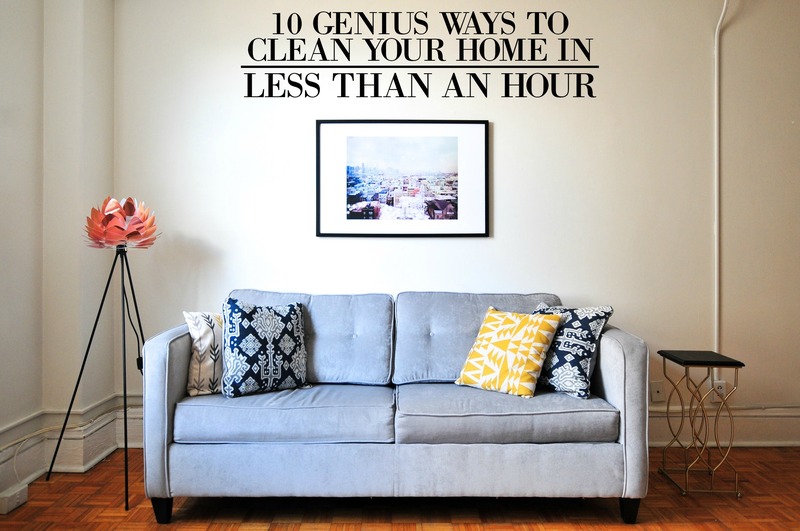 But don’t worry, these quick cleanings tips will allow you to see a noticeable difference in your home’s tidiness in a short period of time. So check out these simple cleaning tips and let us know what you think! Setting your timer will help you stay determined to finish before that alarm goes off. This can also be a great way to involve the kids and turn cleaning into a fun family game! As you’re zipping around the house, keep a laundry basket with you to fill with things that don’t belong. Once you’re done cleaning, put back all of the things you’ve found that don’t belong to their proper place. To maximize efficiency, keep all of your cleaning supplies in a convenient tote bag, cleaning caddy specifically for cleaner’s, or just a plastic bucket. This way you won’t be running around trying to find everything you need. Load up the dishwasher with all of the dirty dishes and let the non-dishwasher safe kitchenware soak in hot water. Like the “Doesn’t Belong Basket” for items that can be relocated, carry a garbage bag with you to throw out the trash and garbage you find throughout the house. That way you can easily remove clutter and garbage swiftly and efficiently. If you’re limited on time, focus on vacuuming in highly trafficked areas, corners, and anywhere dirt is visible in your home. Dusting all of the areas where dust is visible, (i.e. counters and bookshelves), will help to spruce up your home and remove all those dust bunnies. Spraying and wiping down any surfaces including your countertops, cabinets, appliances, tub, toilet, tables, is a quick and easy way to clean your house. And instead of using a spray bottle and cloth, you can instead use disinfecting wipes for a quick and easy wipe down. Changing your sheets, folding your throws, and fluffing and straightening the pillows is a quick way to clean your bedrooms and make them look cleaner and tidier with very little effort. If time allows, you can lift the mattress and dust it to help remove allergens before returning the mattress to its place. Cleaning out your fridge is especially important when expecting guests because you’ll probably need room to store the goodies they bring as well as leftovers for the following day. Whether it’s spring cleaning season or not, it’s always a good time to try out some time-saving cleaning hacks. So give these a try and let us know how it goes!